Early Seating Families can already Enroll. The course will move to the site home page for open seating on Aug 1st and then the open seating enrollment code will be visible. This is an elementary literature class. Depending on enrollment, a lottery may need to be held for General Seating students to determine which students are seated. 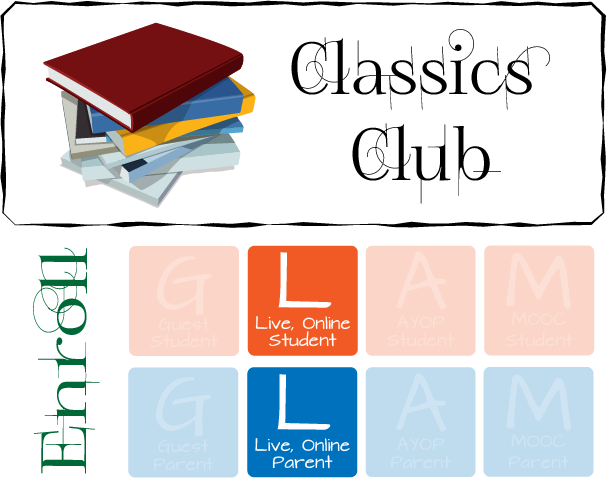 All courses with the title of Club are student-run. This year, we'll start the first full week of September (4/9) and work through the last full week of April (26/4). Our breaks will be the week of Thanksgiving (18/11 - 24/11), the entire month of December, and the third full week of March (17/3 - 23/3). Early seating families are enrolling now. Use the key given in the Early Seating course page. General seating will open on August 1st at Noon Central and run for 24 hours. General seating is not first come first serve it is lottery-based, so no need to feel rushed to be on the site at noon when so many are on. Come on in later in the day and the site will be faster. We literally have thousands on at the same time in that first hour. Live classes are very popular and if we do not have enough seats for all in general seating that want in, we will seat for what we do have and then call for more volunteers to step up and open more seats as they do and then run the lottery again. We extend the search for more volunteers for about two weeks. Fix-it! 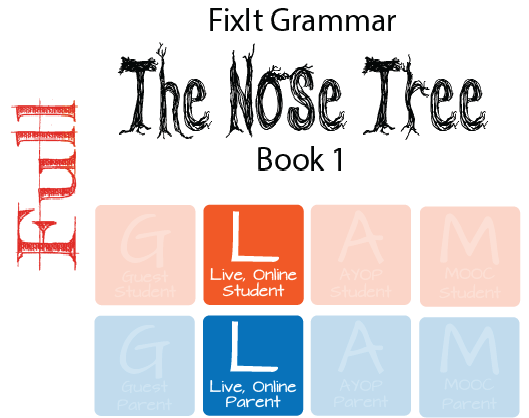 Grammar Book 1: The Nose Tree is the recommended starting book for any child in grades 3-12. If you feel that your child would find this book too simple, they may take a placement test. The placement test is found at this link. If they pass the placement test, they may move on to a higher level book. This class is not meant to fulfill a full English credit. It should require 15 minutes a day, 3 or 4 days a week, plus the online class time (30-45 minutes) once a week. This will be a total of about 1 1/2 hours a week. Each family must own The Nose Tree Teacher Manual. This is for copyright purposes and also so that the parent can help their student as needed. Each student needs a copy of the student book. The teacher manual includes a link to download a copy of the student book for free. You can either print the student book or buy one preprinted. Access to a dictionary is needed. The student needs the ability to upload a clear picture or scanned copy of the handwritten weekly rewrite to be graded by the teacher. A headset will be a huge help in the online classroom so that the student can speak in the mic without echoing. Please be sure that viewpure.com is on the list of allowed sites for your family. Once a week, the teacher will meet in the online classroom with the students to correct the students' edits from the previous week, review the vocabulary words, teach the current week's lesson, and do the Day 1 passage for the current week together. During the week, the kids are responsible for rewriting the previous week's passage that has now been corrected in the live class, uploading that rewrite for a grade, finishing the current week's edits, defining the week's vocabulary words, and being at the next live class ready to discuss their edits. Also offered on the course page are weekly grammar cards and vocabulary cards to study via Quizlet. Quizzes on these cards will appear periodically. The quizzes are optional and at the discretion of the parents. It will not adversely affect the students' grade if they are not taken. They were created to be used by families who needed or wanted extra grades. Fix-it! 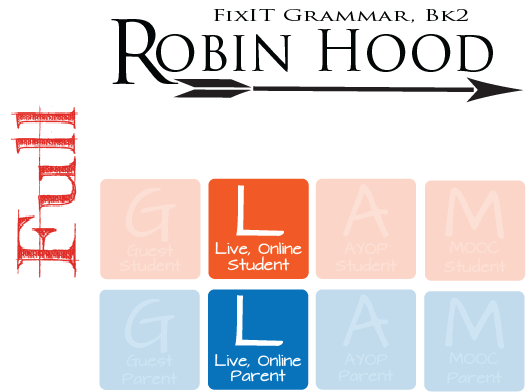 Grammar Book 2: Robin Hood is the second book in the Fix-it Grammar series. Book 1: The Nose Tree is the recommended starting book for any child in grades 3-12. If you feel that your child would find Book 1 too simple, they may take a placement test. The placement test is found at this link. If they pass the placement test, they may move to Book 2. Each family must own The Robin Hood Teacher Manual. This is for copyright purposes and also so that the parent can help their student as needed. and do the Day 1 passage for the current week together. and being at the next live class ready to discuss their edits. NOTE: This course will cover only the first half of the Fix It Grammar 3 book during the year. Book 3 is intended for grades 6-12. If you are new to Fix-it Grammar, please have your child take the placement test to be sure they are ready for Book 3. Please note: Fix-it! Grammar Book 1: The Nose Tree is the recommended starting book for any child in grades 3-12. If you feel that your child would find this book too simple, they may take a placement test. The placement test is found at this link. 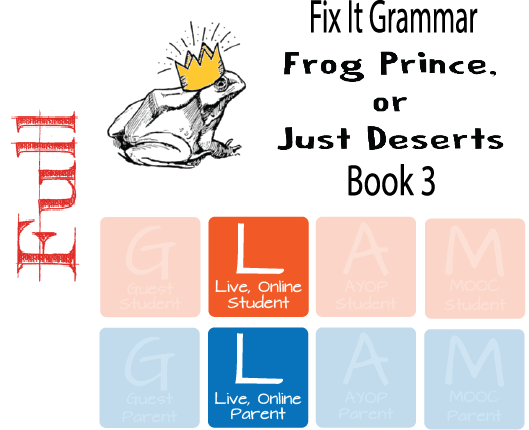 If they pass the placement test, they may move on to a higher level book, such as this book Fix-it Grammar Book 3, Frog Prince, or Just Deserts. Each family must own The Frog Prince, or Just Deserts Teacher Manual. This is for copyright purposes and also so that the parent can help their student as needed. NOTE: This course will cover only the first half of the Fix It Grammar 4 book during the year. Book 4 is intended for grades 6-12. 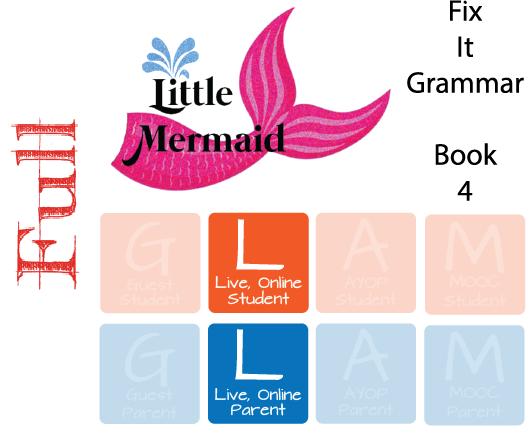 If you are new to Fix-it Grammar, please have your child take the placement test to be sure they are ready for Book 4. Please note: Fix-it! Grammar Book 1: The Nose Tree is the recommended starting book for any child in grades 3-12. If you feel that your child would find this book too simple, they may take a placement test. The placement test is found at this link. If they pass the placement test, they may move on to a higher level book. We have four levels available on VHSG. Each family must own The Little Mermaid Teacher Manual. This is for copyright purposes and also so that the parent can help their student as needed. Covering the nine IEW units, this course develops composition, grammar, and vocabulary skills while students write about American history from the Explorers to the Twentieth Century. This is a live, online classroom course. Students meet weekly in the online classroom for the lesson time and upload their essays, narratives, and poems into our uploader where they will be scored against a rubric. It is a nice assignment format that really helps students to think deeply about the expectations and get a chance to share their work with classmates. If you get it from a different location, be sure the text has this cover ... There is an old version out there that is NOT compatible and cannot be used. This live class is full. Competitive Speech & Debate is a 20-week course designed to quickly take novice public speakers through the basics of speech-craft and prepare them for effective competitive debating. Students who complete this course will be well prepared to join speech and debate tournaments in their area, or simply improve their ability to effectively present and defend their ideas. This will be a rigorous high school level course and will require approximately one hour each weekday out of class for research and preparation. No text is needed, but students must have a means to share their speech and participate in debate. Some performances will be live in the online classroom and others the student will provide a recording link for instructor and peer review. All students must have a webcam, headset with microphone (quality of audio will play a part in scoring), and access to YouTube, Vimeo, or a file hosting account (Drop Box, Google Drive, One Drive, etc.) to post their own speech recordings. To accommodate families that have blocked YouTube on their student's computers, our example presentations are provided through ViewPure. Please white list this website. Students that use YouTube to host their performances will be instructed how to adjust their video sharing settings to viewable but unlisted and how to use ViewPure to get a link classmates can view to put in to peer reviewed activities.